You know those features you’ve had on your Snapchat wish list? Well, you must have been good this year, because Instagram Stories just launched them. 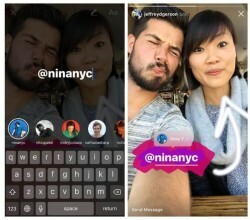 Users now have the ability to post links, live streams, tags and Boomerangs within Stories. Let’s walk through these new tools and how they’ll benefit you long into 2017. Mentioning someone in your Story adds their handle over your photo/video/Boomerang. Viewers will be able to tap the mention to view that person’s profile. This feature will be especially valuable during takeovers or when cross-posting with collaborators or artists on the same tour. Also consider this as a more personal way to reply to fan comments, especially during an Instagram Stories Q&A. How to: Begin typing the handle (starting with the @) you’d like to mention. Instagram even suggests contacts as you type. Boomerangs are great for moments when you’d like to break up the photo posts, but don’t have time to create video content. They’re easy to make and visually engaging for fans. Until now, creating Boomerangs required a separate app, but this far less bulky experience allows you to add personality to that Story with minimal effort. How to: Beneath the “record” button at the bottom of your screen, you’ll now see the word “Boomerang.” Tap and get Boomerang-ing! Following in every other social platform’s footsteps, Instagram has begun rolling out live video for all users. The broadcasts, which will live within the Stories and Explore sections, will disappear once they end. To ensure that fans don’t miss your streams, consider encouraging them to enable post notifications for your account. Otherwise, an algorithmically-selected pool of followers will automatically be notified. Much like Facebook and Periscope streams, viewers are able to interact by adding “hearts” and comments, making it a great platform for an impromptu Q&A. How to: Navigate to your Instagram Stories camera. If you have access to live video, there should be an option for “Live.” If not, don’t fret — the feature is slowly rolling out to all accounts. This one is a bonus for verified accounts. When viewing a story that contains a link, fans will notice a “See More” link at the bottom of their screen. Upon clicking, they’ll be led to the link of your choosing without even having to leave Instagram. This is now the most seamless way to direct Instagram followers to your product, premiere, ticket merchant or mailing list registration. How to: Verified accounts will now see a hyperlink icon at the top of their screen before publishing a Story. Finally stepping out of Snapchat’s shadow, these updates make Instagram Stories a better discovery and conversion tool for any artist or brand. Get ready to be discovered!